While regularly scheduled art classes will continue, summer arts camps and special classes are right around the corner! Pre-registration required unless noted…these fill up fast! 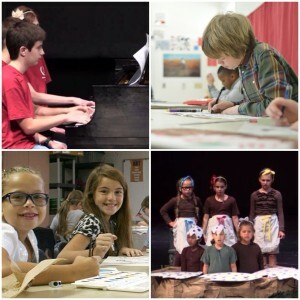 Students will receive instruction in acting, voice, dance, and additional curriculum related to musical theatre. Faculty and staff are established performing artists who regularly work in regional and professional theatre companies and serve as university professors. In addition to the musical production, students will have the opportunity to perform on student recitals, building self–confidence skills. Vocal soloists will be accompanied and coached by collaborative artists extensively trained in musical theatre repertoire. A full–length musical production will be performed at the end of the week, open to the public to showcase the students’ accomplishments. 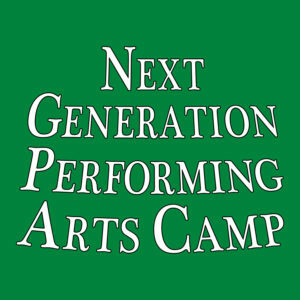 Contact Info: Valerie Canon (musicaltheater@nextgencamp.com) or Dr. Jan Hanson (musicaltheater@nextcamp.com). All young artists attending camp will receive private lessons, chamber music coaching, and music theory instruction from faculty and staff with active performing and teaching careers. The festival orchestra performs two concerts featuring a variety of literature for strings. Each student is assigned to an age–appropriate chamber music ensemble. These chamber groups receive intensive coaching to assist emerging professionals in rehearsing, exploring, and preparing the work for performance on the final concert. Additionally, all students will have the opportunity to perform a selection from their solo repertoire during camp recitals. Contact Info: Dr. Jim Waddelow (instrumental@nextgencamp.com). Each camp costs $350 for the entire week, this includes tuition, room and board along with all course materials. $25 non-refundable application fee; $125 deposit to hold students spot if accepted; remaining $200 paid upon arrival to finalize registration. Click on the respective program’s title to register. Questions? Contact Carolyn Hardison at hardison.carolyn@occ.edu or 417.626.1234 ext. 2400. 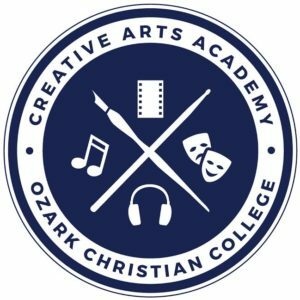 To register for the Creative Arts Academy click here. Send your little artist on an adventure through the worlds of famous artists like Van Gogh and Leonardo Da Vinci! During this camp participants will learn about iconic works of art and bring home their own masterpieces! Learn about fun ways to use recycled objects in crafts! Students will make projects on the themes of water conservation and recycling. This camp makes big ideas easy for our littlest artist to understand and enjoy! Come create edible art during the Creative Cafe! This three day adventure gives your little chef the opportunity to build, decorate, and think outside the box with edible materials! Experience an imaginary safari, explore the ocean, and create art about the animals that live in our area! This camp is for all the youngest story tellers out there! Come make art about your favorite fairy tales, learn to make a story with your friends during our collaborative story time, and have fun imagining new worlds to explore during this magical, creative camp! For all those little artists who like to get a little messy, this camp is for them! Come build with model magic and all kinds of fun, new materials! Learn how to use basic shapes to sculpt animals, flowers, and anything you can imagine! Come create yummy art based on all of our favorite deserts! You’ll be making things like doughnut sunglasses, cupcake sculptures, and we’ll look at paintings by artists like Wayne Theibaud who make sweet, sweet artwork! This camp will be full of all things fuzzy, soft, and full of texture! Wear your paint clothes and get ready for a color explosion! Learning about mixing colors and making brilliant, bright artwork all through this camp! Come and learn from artist Jane McCaulley in this three day glass-crafting adventure! Create beautiful mosaic and works of art that interact with natural light in beautiful ways! Ages 9-12 are welcome. Learn to live creatively with artist Sarah Serio! 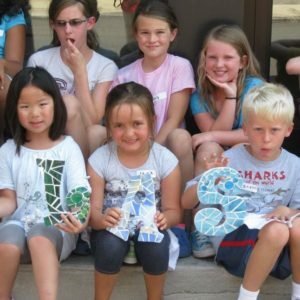 This camp will explore the basics of sculpture using reclaimed objects. Discover new ways to take care of the environment and utilize nature in artwork during this 3 day recycling art adventure. Explore the diverse world of printmaking with professional print-maker, Sarah Serio. This camp will give you the opportunity to learn about different print-making techniques and materials while creating fun, fabulous artwork! Draw, sketch, and doodle through this adventurous camp while dividing into new mediums like charcoal, sumi ink, and conté! Did you miss out on the PhotoSpiva workshops? Are you looking for more fun with a camera? Drop in for a 3 day camp on all things photography! Students will learn the basics of photo composition and the history of photography, and also have the opportunity to polish their story-telling skills through the photos they take! Come sculpt and create with artist and teacher Lacey Satillian! This class takes place on Monday, Wednesday, and Friday due to the nature of the materials they will be working with. Get ready to dive into 3 days of messy, creative fun with artist and teacher, Audrey Wheeler! 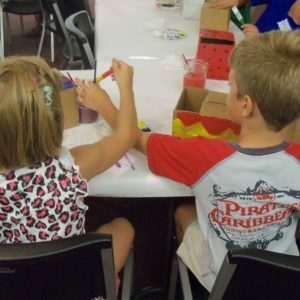 This camp will explore different painting mediums and delve into diverse styles and techniques in a fresh, fun way! For all the young Van Gogh and Da Vinci’s out there, this camp is for you. Are you fascinated by weaving? Do you ever wonder how fabrics are made or decorated? Well this camp is for you! Come learn from textile artist, Audrey Wheeler as she explores different kinds of weaving, fabric dying, and stitching! Discover artists who live here and around the world who create their artwork using the fiber art techniques you’ll learn with Audrey! Learn new techniques in sculpting and ceramics! This camp will take place Monday, Wednesday, and Friday due to the nature of the materials used. *Please note these camps begin at age 9 for safety reasons. Whether you enjoy comic book art, Manga, cartoons, the art of Disney, or you just love the art of illustration, this camp is for you! 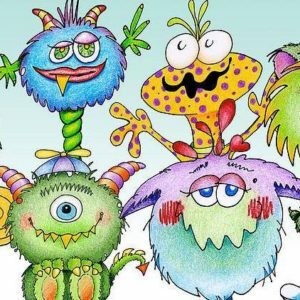 During this three day camp you’ll learn about what makes a character strong, how to tell a story through a single image as well as through a comic book layout. By the end of this camp you will have created and illustrated your own story. To register for Spiva art camps, visit click here. You can also register for by calling 417.623.0183. 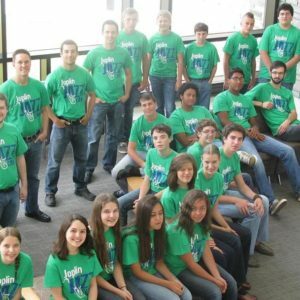 The Joplin Jazz Camp will provide each student with a foundation in the jazz idiom through classes and rehearsals that emphasize improvisation, theory, jazz history, ear training and transcription of solos, melodic patterns, and jazz style and interpretation. Students are encouraged to think creatively and truly dig in an experience the music through active learning, rather than simply practicing patterns out of a book. The faculty strives not only to mentor these young students, but also to foster a positive learning environment where they aren’t afraid to take risks in their playing and improvising. The Joplin Jazz Camp’s ultimate goal is to make each and every student a better person, a better performer, and to inspire them to carry on the wonderful legacy of the music we call jazz while simultaneously continuing to innovate and seek out new forms of musical expression. To register for Joplin Jazz Camp, visit tjeffschool.org/jazz and fill out the registration form. For more information call 417.434.5779. Join for a week of Princess magical fun! 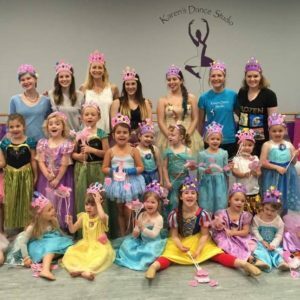 Play princess games, read stories, have snacks, and of course learn Princess dances. There will be a special ballet performance from a popular princess and the camp’s finale will feature little princesses performing for their parents! This camp is for the skilled ballet dancer that is looking to expand both their technical ability and knowledge of ballet. Cecchetti is the Italian method of ballet that systematically encourages strength, knowledge and technical expertise in dancers. This summer session offers ages 2 through adult various options for classes in ballet, tap, jazz, hip hop, hip hop tot, pointe, contemporary, acrobatics, voice, and more. Sign up for an extensive pre–k programs with lots of class times to chose from. Call today to reserve your spot as class size is limited and spaces fill quickly! 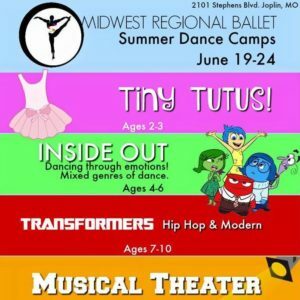 To register for Karen’s Dance Studio camps, you can drop by the studio at 2113 Davis Blvd Joplin MO 64804 call 417-623-1093 or email info@karensdancestudio.com. The Children’s Department offers many exciting arts and cultural opportunities for throughout the summer months. These offerings include: Drawing in Perspective, Dog Day Afternoon, Explore and Play, Finger Weaving, and many more. For a full schedule with days, times, and description, click here! Call 417.623.7953 for more info. Discuss current manga reads, have guest speakers, play games, or work on your own manga creations. Most months, also watch at least one episode of anime. Also, there are snacks. Head back to Hogwarts with a super colossal, Harry Potter geek out chock full of games, trivia, activities, crafts, and more. Costumes are highly encouraged but not required. It’s your world, let your voice be heard. Discover how to effectively communicate with elected officials at all levels and how to connect to your community. This is a non-partisan, solely informational program. Choose a book based on the theme and come prepared to chat about it. July’s theme: books with a red, white, or blue cover. Bring a brown bag lunch; dessert provided. To register for any of the teen or kids events please call 417.623.7953 or stop by the Children’s and Teen’s desk at the Joplin Public Library. Do you have a young artist at home who also enjoys nature? 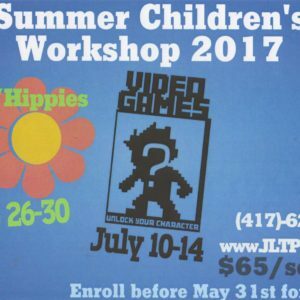 Help cultivate their interests by sending them to this art camp! Led by certified art teacher Anne-Marie Gailey, meet at the Center each afternoon and use nature as inspiration to create original pieces of art. Making paper by hand can be a fun and simple process! It’s a great way to use scrap paper. With basic instruction, beautiful handmade paper will be produced! Some scrap paper will be supplied but students are encouraged to bring heavier weight and color scrap paper. Create animal sculptures from recycled materials, too! Using a variety of plastic bottles, small to medium size boxes, cardboard pieces, etc., everyone will construct an additive sculpture part by part! Add paint, paper and bring items for eyes, horns and texture to complete the details on your sensational creature! Pictures of animals in our region and view artist’s 3D sculptures from recycled materials. Pre-registration and payment to instructor due by noon on June 16th. Payment for this class should be by check or cash only to instructor. Fee includes most art materials, a snack, and instructor’s fee. Terrariums, botanical cards and more! Led by certified art teacher Anne–Marie Gailey, we meet at the Center each afternoon and use nature as inspiration to create original pieces of art. Create your own unique mini–world of plants by making a beautiful, low maintenance garden of small plants, rocks and soil. Learn about plants, water and soil. Plan a theme and bring miniature figurines and other small items to decorate with. Next, you will illustrate botanical cards. Discover native plants and using color pencils and watercolor, compose different designs. Add a bird or insect! Repeat these for a set of cards! Explore the plant illustrations of several botanical artists and of course the birds of Audubon, too. Students may bring a few very small, waterproof items to add to their terrariums, if they wish. Pre–Registration and payment to instructor due by July 7th. Payment for this class should be by check or cash only to instructor. Fee includes most art materials, a snack, and instructor’s fee. Do you have a young naturalist at home? Help cultivate that interest in nature by sending them to our outdoor summer camp! Led by qualified staff and volunteers, we will meet at the Center each morning before we go outdoors to explore various habitats. Each day we’ll learn about different groups of animals: birds, mammals, amphibians, reptiles, fish, and insects and other invertebrates. Limited to 12 children. Children should be in good physical condition and able to hike in summer weather. We will provide a snack, or they may bring their own from home. For the convenience of working parents, we will provide supervision from 7:30 am.–12:30 pm. Partial scholarships available from Wild Birds Unlimited for children who qualify for the free or reduced lunch program at school. Payment for this class should be by check or cash only to instructor. Fee includes most art materials, a snack, and instructor’s fee. Ready for some adventure? How about kayaking, a zip-line, and some shooting sports? We’ll do these fun outdoor activities along with a trip to a certified challenge course to test our courage and do some team-building. We’ll also learn about outdoor ethics and the leave no trace philosophy, and volunteer for a community habitat improvement project. Led by qualified staff and volunteers, we will meet at the Center each morning before we go outdoors for our adventure. Limited to 10 children. Children should be in good physical condition. We will provide a snack, or they may bring their own from home. For the convenience of working parents, we will provide supervision from 7:30am–12:30pm. You may register for any of Wildcat’s camps by calling 417.782.6287, stopping by to do it in person, or by emailing your information to wildcatglades@audubon.org. This summer Joplin Little Theatre will be offering two weeks of fun workshops for ages K-12. Both workshops have morning (9am–Noon) and afternoon (1–4pm) sessions to allow everyone the opportunity to take part. Cost for each session is $65, a pre-enrollment discount of $60 is available if enrolled by May 31, 2017. Register for Joplin Little Theatre workshops by clicking the “Buy tickets” on the Joplin Little Theatre website, by calling 417.623.3638 during regular office hours or by stopping by JLT during regular office hours. 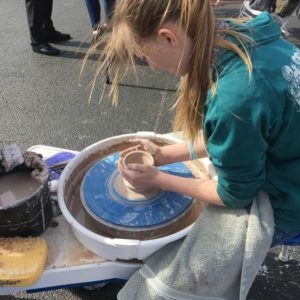 Students will get instruction in basic throwing, hand–building (pinching, coiling and working with slabs) and sculpting. Cost: $175 and includes a T–shirt and all clay glaze and firing. Phoenix members get a $25 discount. To register, call Phoenix Fired at 417.437.9281. Summer discovery academy summer enrichment camps at TJ start on June 14. TJ summer enrichment courses offer something for everyone, and many of the courses are focused on the arts, sciences and academics. They offer opportunities for children in all grades to explore there interests in: string instruments, dramatic performance, computer programming, digital filmmaking, studio arts, photograph and photoshop, rocket science, claymation, stop motion video, robotics, musical theatre performance and musical theatre production (lights, sound, sets and stage management). Register your child today at tjschool.org/summer. Enrollment is offered to students pre K –12. Spend an active week learning new songs and choreography at this week-long camp sponsored by Joplin High School Show Choirs. Kids who will be in Grades 2-8 in 2017-18 will make new friends, and develop a terrific show to perform for parents and friends on Thursday at 11:30am. Parents can drop off kids by 7:30am, and pick them up by 11:30am. Cost is $60 and includes snacks and a camp t-shirt. Click here to register. For more information about times, prices, and registration please call 417.439.9549. 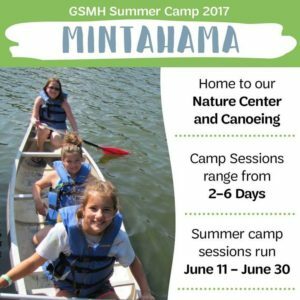 Learn about the Missouri state bird, native flowers, and the animals, insects and plants at Camp Mintahama. Swim, sing, hike, and make new friends! Girl Scout Daisies will earn the Use Resources Wisely petal. The perfect first sleep–away camp! 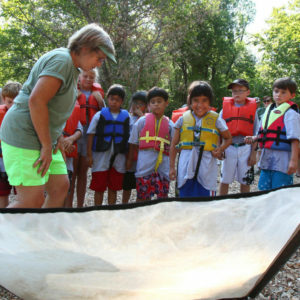 Use all your senses to learn about birds, bugs, flying objects, and enjoy traditional camp activities. Girl Scout Brownies will earn the Hiker and Bugs badges. Join fellow Harry Potter fans as you experience the Sorting Hat, compete in a Quidditch match, hike in the Forbidden Forest, and make fabulous Hogwarts crafts! Girl Scout Juniors will earn the Outdoor Camper and Playing the Past badges. Relax in the woods with yoga and meditation. Free your creative spirit through nature–inspired crafts. Traditional camp activities round out a fabulous week of fun. Girl Scout Juniors will earn Digital Photography, Healthy Living, and Outdoor Art Explorer badges. Find your way back to Hogwarts for another summer adventure. Spend time on the Quidditch pitch, create your own Marauder’s Map, and explore the creepy crawlies that inhabit the Chamber of Secrets. Girl Scout Cadettes will earn the Night Owl and Good Sportsmanship badges and Seniors will earn the Collage Artist and Game Visionary badges. Let your imagination run free. Create an art journal to collect drawings and thoughts. Try your hand at creative writing, and document your ex–periences through photography. Girl Scout Seniors will earn the Sky badge, Cadettes the Book Artist badge. 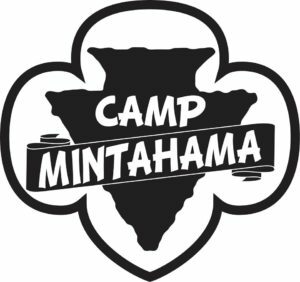 To register for Friends of Mintahama Camps, click here.